I managed to get to a couple of Olympic events and spent a day in the park. It’s been a fantastic meeting. The next few posts will consist of some badly taken photographs. 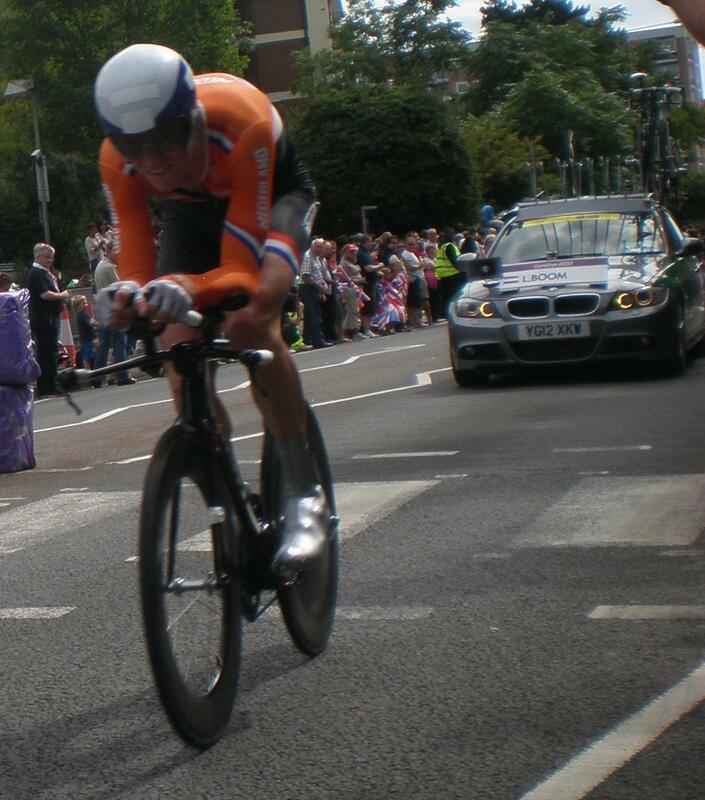 The first event I went to was the Men’s and Women’s cycling time trial. 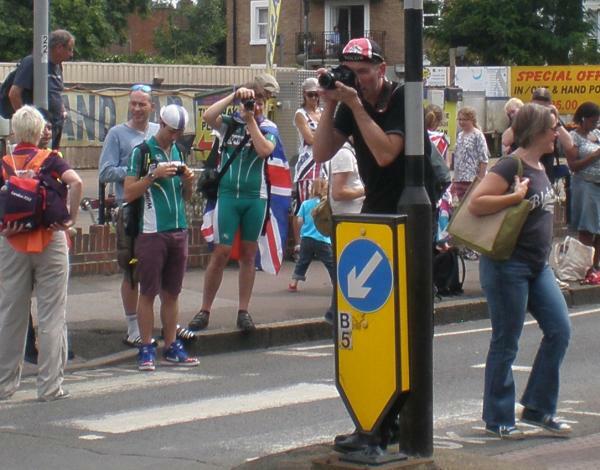 I was invited to Surbiton (about 5km from the finish) by a friend from my Willesden CC days. It was great to meet up with the West London gang again. 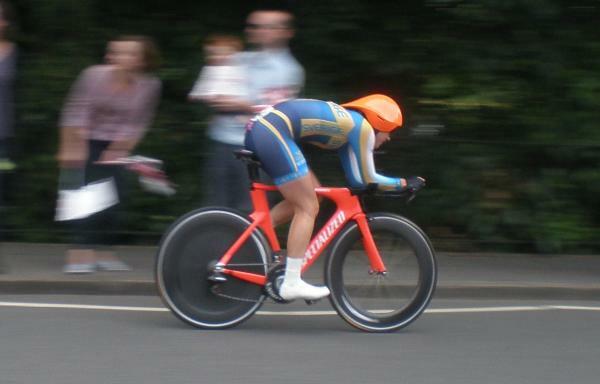 My photos of the women’s event were (even more) rubbish so they are not included. Emma Pooley did a great ride but the course did not suit her. 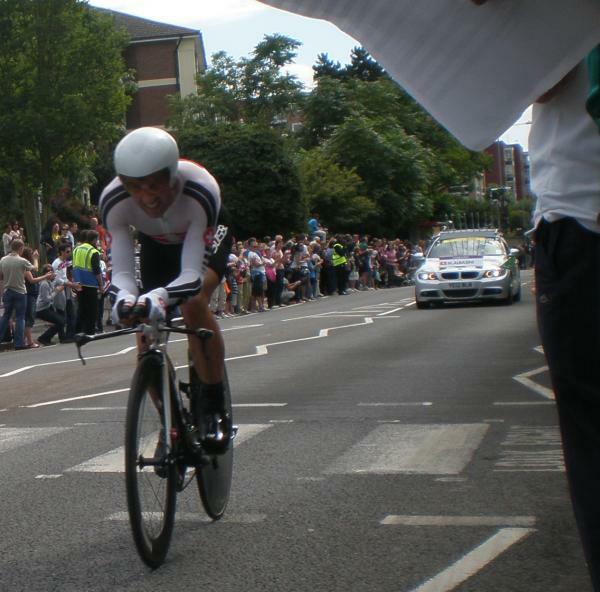 The men’s race was dominated by Bradley Wiggins. I didn’t photograph any of the leading contenders because I wanted to be there in the moment. Crowds – if you make it free, they will come. A Swedish rider. About the only one I got in focus from this side of the road. >Today I rode a turbo session with a purpose designed video for the first time. It was the hour long The Hunted from Sufferfest. I can recommend it. It creates a story – you’re taking part in a race – and uses real life race footage to support it. It’s not as good as a well-run, coach-led session in a room full of other turboists (Thursdays too now), but it might be the next best thing. The session is based around your perceived exertion on a scale from 1 (easy-peasy) to 10 (as hard as a hard thing). Most of The Hunted is pitched between 6 and 8 with some short burst of 9. There are a couple of recovery sections at 4. I’m supposed to be maxing out at about 5.5 at the moment, so I scaled back the efforts accordingly (the scientific term is ‘wimped out‘). The story of The Hunted involves a series of sustained efforts including a 20 minute climb. You are regularly prompted to cover a move, take a break, change cadence, take a turn at the front etc. My interest was constantly engaged. I enjoy immersing myself in stories (it’s compulsory with the day job) and I found this approach fun – not a word I normally associate with the turble. I was so involved that I almost tipped over the rig on a couple of the hairpins on the descents. I found myself jumping for cover behind the camera motorbike at one point as well. Will it bear repetition? If used sparingly I think it will. I’ve pencilled it in as my regular Monday gig for the next three weeks. I’ve seen other DVDs for sale, but the real race footage marked The Sufferfest line out for me. I prefer the text prompts and music to being talked at as well. There are other titles available which I’ll invest in as funds allow (or as being snowbound drives me up the wall). The vids are available as a download. The quoted $10.99 worked out at £8.59 after VAT had been added. It took about an hour to download. I unzipped the compressed files and cut them to DVD. I also downloaded a free media player (VLC) because the installed Windows XP player on my ancient PC can’t cope with .mp4 files.